Ameritemp Temporary Rental Chiller for process or comfort cooling requirement. - 5 to 500 Ton, 460V 3Ph & 208V 3Ph units. - Cam type electrical/water connections. - Circuit breaker or fused disconnect. - Units may be trailer mounted. ​- 250 to 1,000 tons, 460V 3Ph units. - Base frame with overhead lifting frame, coil protection. We rent 5, 7, 10 and 13 Ton Chillers. The SQ Service portable chillers are designed for indoor use in industrial manufacturing locations. The chillers are produced in our ISO 9001:2000 certified facility. 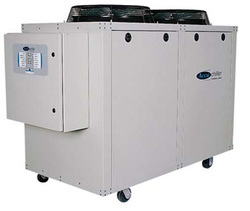 Water-cooled and air-cooled units ship with a full refrigerant charge. Units with a remote air-cooled condenser ship with a nitrogen charge. All units are housed in a heavy gauge painted steel cabinet with tool-free access. 5 to 500 Ton, 460V 3Ph & 208V 3Ph units. 250 to 1,000 tons, 460V 3Ph units. • Heat Exchangers- Custom sized per applications.